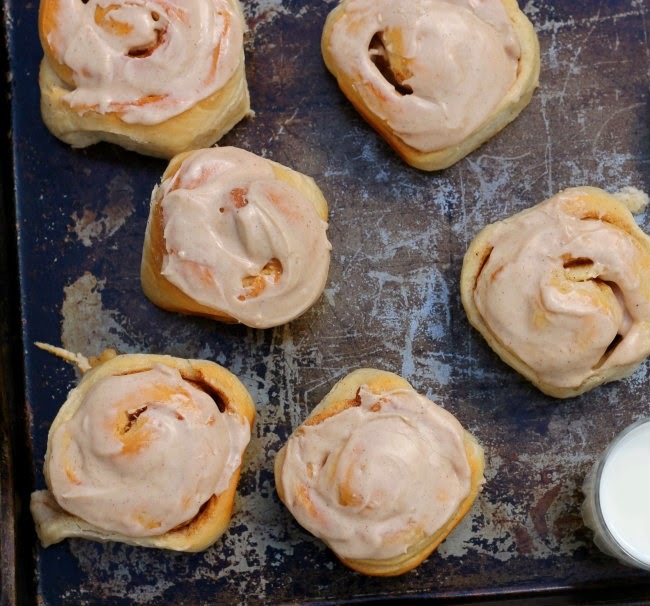 There is something about fall that calls for cinnamon rolls. 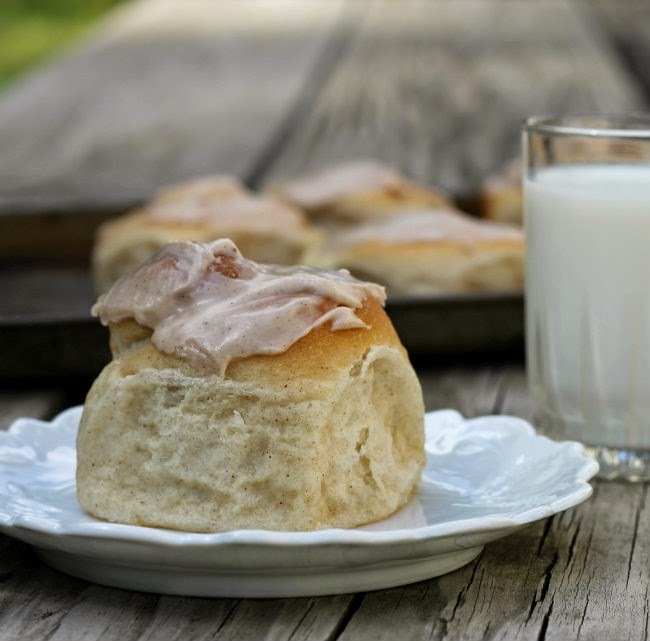 Yes, I do love to eat and make cinnamon rolls year round. But the smell of cinnamon rolls baking in the oven and the aroma of cinnamon filling the house makes me think of cooler weather. Adding apples to the mix of things definitely makes me think of fall. When my kids were small I would make cinnamon bread for Christmas every year. No one really cared for raisin baked into their cinnamon bread, so I started baking apples into my bread. So when I got the urge to bake cinnamon rolls this past weekend I decided to add a few apples. I actually had some apples sitting in the refrigerator that needed to be used up before they were too bad. It was a win win situation… I hate throwing food away and we loved the apples in these cinnamon rolls. I did something a little different to my dough this time too, I added cinnamon to the dough. Even the icing got a touch of cinnamon to it. The cinnamon flavor really came through for these rolls. 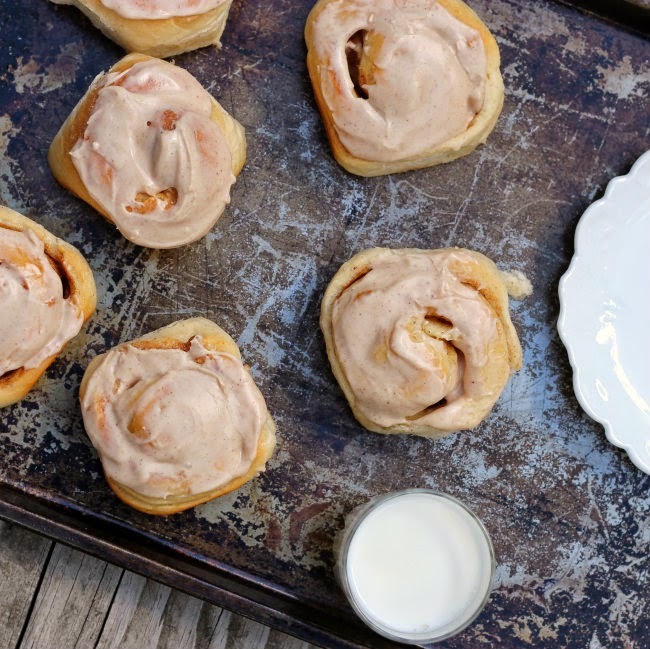 Apple and cinnamon rolls… I have decided that they are the perfect roll for fall. 1. To a large bowl (I use a large bowl so that I can knead the dough right in the bowl) add the yeast, the warm milk and water, and sugar. Mix well and let set for 10 minutes. 2. Add the melted butter and egg to the yeast mixture and blend in. Take 2 cups of flour, salt, and 1 teaspoon of cinnamon and mix in by hand. Gradually add the additional flour kneading the dough until it is smooth and just a touch stickiness. 3. Grease the bottom of the bowl and turn the bread so that both sides are greased. Cover and let rise until about double for about 1 1/2 hours. 4. While the dough is rising, take you apples and peel them, chop or cut into small pieces. To a small skillet add the 1 tablespoon of butter and melt over medium low. Add the apples and cook stirring often until the apples are just getting soft but not falling apart, about 2 to 3 minutes. Set aside so that they cool before adding to the rolls. 5. Once the dough has doubled in size divide into 2 even pieces. I like to grease my surface instead of flour for rolling the dough out. So generously grease your surface for rolling the dough out. You can use your hands to pat out the dough or a rolling pin to roll it out. Either way you want the dough to be about a 13 by 10 rectangle. 6. Blend the 1/2 cup of sugar and 1 tablespoon of cinnamon. Take softened butter and spread over the dough. Sprinkle half of the sugar and cinnamon mixture over the butter. Take half of the apples and place them over the sugar and cinnamon. 7. Starting at the short side start to roll the dough up, making sure to roll it tight. Pinch the end so the they don’t separate. Place the rolls in a greased 9 by 13 pan. 8. Repeat the procedure with the second dough ball. So you will end up with two pans of rolls. Cover and let them rise for about 45 minutes. 9. Place the rolls in a preheated 350 degree oven and bake for 18 to 20 minutes or until they are lightly browned. 10. Remove from oven and set on cooling rack to cool completely. 11. While the rolls are cooling add 2 cups of powder sugar to a small bowl along with the butter, dash of salt, cinnamon, and vanilla blend together. Gradually add hot water until you have the right consistency. Beat until smooth and creamy. Frost the cooled rolls. Dawn, Apple-cinnamon ANYTHING is a win in my book. These look wonderful! I can smell them from here!! Oh, cinnamon has a way of adding that extra excitement to bread doesn’t it! Love this, looks goey and delicious. 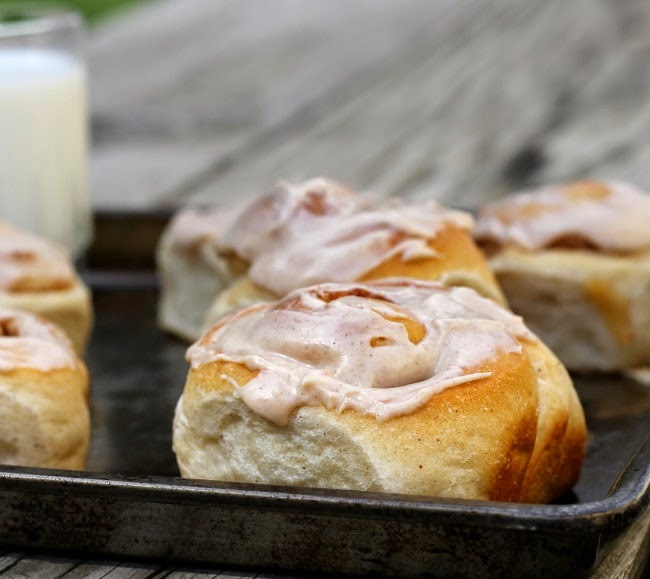 Sweet buns….yum!